Here’s the schedule of activities and events for the month of April. Check out the Grace Baptist Teens Facebook page for ongoing updates of teen activities and happenings. American missionary to Germans in the Regensburg area, Bob Radank, will be our guest on Mother’s Day, May 12. He will tell us about his mission work in the 9:45 Adult Bible Study and preach a Mother’s Day themed sermon in the 10:45 Morning Worship Service. Romanian national missionary to Gypsies in Hungary and Romania, Mircia Pricop, will be our guest on May 19. He will tell us about his mission work in the 9:45 Bible Study and preach in the 10:45 Morning Worship Service. Being Romanian and working with Gypsies, of course Mircea plays the accordian! He will bless us with special music as well as his message from God’s Word in the morning service. These will be two special meetings you will not want to miss. Teens and teen parents, DON’T MISS THIS EVENT! More details to come. Join us for a time of food and fellowship after the Morning Worship Service. The church will provide hamburgers, hot dog and buns. There will be a sign-up sheet passed around a couple of weeks prior to the event for people to sign up for complimentary potluck dishes to bring. Guests are invited and do not need to bring food. Either way, it’s always a big, delicious event! DON’T MISS IT. Bring a friend to the service and the Grill-out & Potluck afterwards. And pray for good weather! About 50% of the time our past events were able to be outside and the other half we have had to eat indoors. Join us for our Easter Resurrection Celebration activities! SCHEDULE CHANGE: There will be NO 9:45 Bible Studies or Kids Sunday School on Easter. EASTER BRUNCH AT 9:15 AM: Join us Easter morning for a delicious potluck breakfast and a leisurely time for good fellowship. The church will provide ham and rolls, tea and coffee. There will be a sign-up in April for breakfast casseroles, fruit, veggies, and other necessities. If you are a guest with us on Easter Sunday, don’t bring anything but yourself! There will be plenty to eat and food left over afterwards! EASTER CELEBRATION AT 10:45 AM: Our celebration will feature Easter worship songs as we joyously rejoice that JESUS IS ALIVE. This will be followed by a special Easter message from Pastor Sligh. Join us and bring along some friends to both the brunch and the service! Our ladies have always enjoyed our Ladies Tea. If you plan to attend, please sign the sign-up sheet at the church for the event, or click “Contact Us” below and send us a message that you plan to attend. Girls may attend as long as they can sit at a table for two hour. Childcare not provided. European Time Change – Spring Forward! Don’t forget to set your clocks FORWARD Saturday night of March 30 for the Spring European Time Change or you will arrive late for church Sunday morning! All are welcome to our annual church business meeting. We will go over the 2018 Financial Statement, submit the 2019 Spending Forecast (budget) and vote on church offices. Only church members may vote. Childcare not provided. Interruptions. They're aggravating. Sometimes infuriating. But how we handle interruptions actually tell us more about ourselves. What do we do when God interrupts our lives? Many times, like Jonah, we run! In this DVD/discussion-driven study, Priscilla Shirer redefines interruption and shows that interruption is actually God's invitation to do something beyond our wildest dreams. When Jonah was willing to allow God to interrupt his life, the result was revival in an entire city. Yes, the Ladies Bible Study has begun, but you can join it at anytime. Just show up! Childcare available. / Registration required. See Susan Sligh (the pastor’s wife) at church to let her know you are coming or click Contact below and send us a message. Be sure to let us know many children you are bringing and specify their ages. Join us for a great time of food, fellowship and faith! Bring your sons with you. Registration required on the sign-up list at the church, or by email so we know how much food to buy. A child dedication is an opportunity for you to dedicate your children to God as the parents of Samuel in the Old Testament and Joseph and Mary in the New Testament did. It is also a time for YOU to dedicate yourself as a parent to rearing your children in the “nurture and admonition” (discipline and instruction) of the Lord. If you would like to dedicate your child or children to the Lord on March 3, please register at the Sign-up Table in the church lobby or click “Contact” below and express your desire. An explanation of child dedication and Instructions will be sent to you. Includes dinner of lasagna and dessert, a devotion, adult craft, game night. Skating, hanging out with friends, falling down, like, a million times, and having a great time! Don’t miss it! And bring your friends. Meet at the rink. For questions or more details, fill out a contact form here. McDonald’s Fun and Fellowship this Wednesday! Teens will meet at the Brechler home at 6:00 PM and watch the video series and have discussion. After the study and discussion, they will walk next door to McDonald’s. Parents, please pick your teens at the Brechler home at the usual 8:00 PM time. Teens, remember to bring your money AND bring a friend! 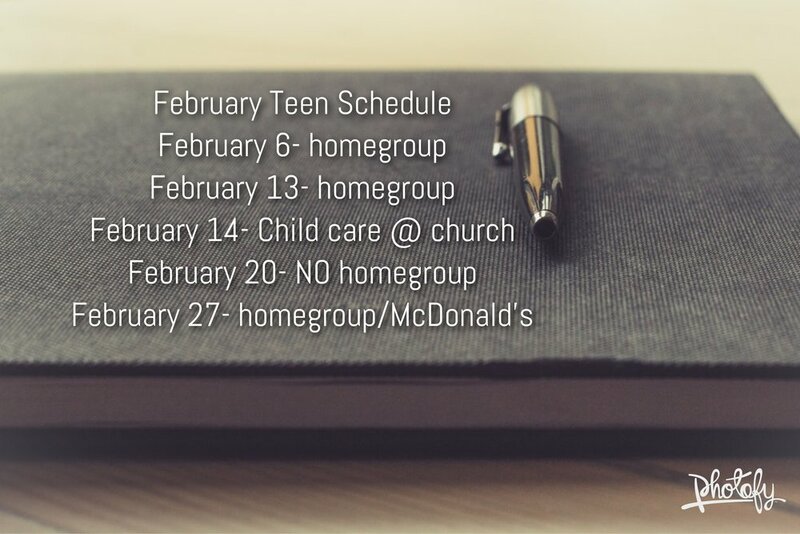 Here’s the schedule of activities for our teens in February! Carol singing, a kid’s program, special music, a pastoral contemplation and a time of fellowship after the service. There will be no 9:45 Adult and Teen Bible Study and children’s Sunday School the last two Sundays in December (the 23rd & 30th). Homegroups, small groups and Bible studies will not meet the last two weeks in December. Each group may schedule additional changes during the holidays, so check with your group’s POC.